The third generation of OnePlus device, i.e. 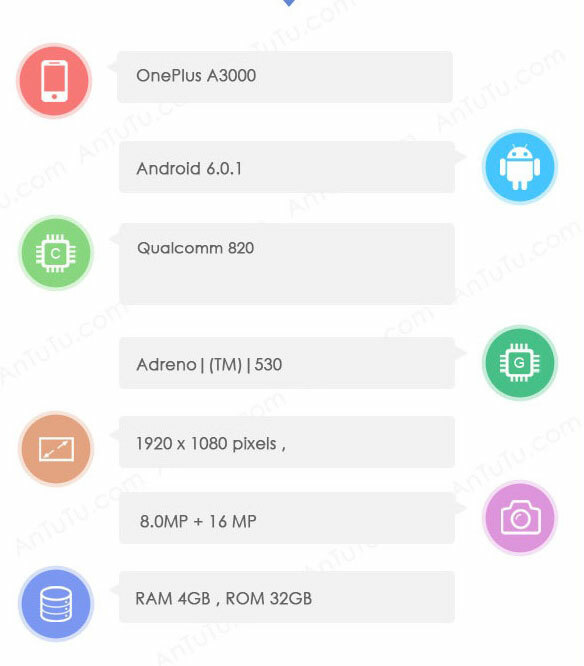 OnePlus 3 (A3000) has been spotted in AnTuTu Benchmark website and the screenshot of the same has been shared in weibo. According to the benchmark listing, OnePlus 3 will carry the model number A3000. Earlier, the officials have conveyed that they will prefer open sales for their upcoming smartphones instead of flash sales or sale via invites that limit the sale of OnePlus devices. This will ensure that the next generation device of OnePlus will have better marketing strategy so that more and more users could buy the device. OnePlus 3 will run on latest version of Android Marshmallow with their own custom UI over the top. The device will be powered by Snapdragon 820 SoC accompanied with Adreno 530 GPU. According to the listing, the device will posses a full HD resolution of 1080 x 1920 pixels instead of Quad HD resolution, though the screen size is still not disclosed. Last year’s OnePlus 2 featured a 5.5 inch display with 1080 x 1920 pixels resolution. OnePlus 3 will have 4GB of RAM for smooth multi-tasking and will have 32GB of internal storage. There is no wordings for the external card support. When it comes to camera, the device will have a powerful 16MP primary camera and a 8MP front facing camera. Overall, third generation of OnePlus device will have better camera than its earlier models. The device will carry the fingerprint sensors from its predecessor, but this time it will be more optimized and more accurate than before. There has been no other information about this upcoming flagship device, but we can expect OnePlus 3 to come with USB Type-C port, fingerprint sensor, Quick Charge 3.0 support, NFC, GPS, Wi-Fi, Bluetooth and 3.5mm audio jack. Last year’s OnePlus device came with 3300mAh battery, so it is expected that the new device might come with 4000mAh battery to have long lasting backup. To get more information about OnePlus 3 and other OnePlus devices, stay tuned with us.